There are times when people’s indulgence feels so heavenly they don’t want to announce and make it public. They selfishly would not share it to other people because if it is made public, others may rush on it and the few ones who previously knew about it may have difficulty availing the same private and secret blissful experience. This is my personal analysis regarding one of the delectable desserts available in Larry’s Café & Bar (LCB) located in Serendra, Bonifacio Global City in Taguig. With this blog post, people who knows and have tasted this dish would for sure hate me since I’m making it public. I am talking about the Baked Blueberry Cheesecake in LCB. This dessert does not look like the typical blueberry cheesecake that has been popularized and available in other food establishments. You would initially ask the server if the dish placed on your table is actually the one you ordered. But if you start getting a piece and place it in your mouth, an ambrosial force would suddenly get into you. You will wonder whether you just had the bite of your life. The taste is a sublime symmetry of mouth-watering flavors similar to a monumental piece of art. 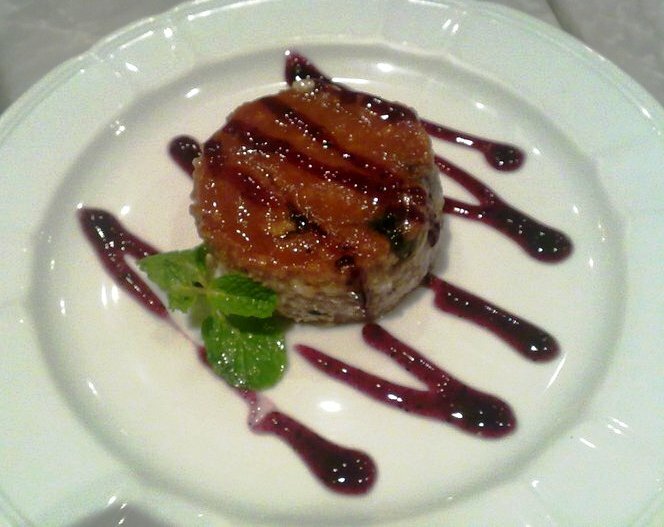 It is the Da Vinci’s Mona Lisa among the blueberry cheesecake renditions. Fattening? Yes. But tell me what dessert of such splendid flavor is not weight-amplifying. It is so good it leads to a mysterious addiction which you would want to secretly keep.